The Church of the Nazarene Free Clothing Room is open to the public twice a month; on the first and the third Saturday of each month, from 10:00 am to Noon. Since we started the free clothing room, we have gladly given away (at no cost) hundreds (perhaps thousands) of bags of clothing. We have a very small room for free clothing. Help yourself to whatever you need, as little or as much. Freely we have received... freely we want to give. If you absolutely can not come during our regular hours, you can contact the church office (633-4903) and ask for a special appointment. We are located at 2111 Centennial Street at the north end of Porter Creek along the Alaska Highway. Our clothing room was originally geared for children's clothing... but there is also a selection of adult clothing as well. Come and take a look. You might be surprised at what you will find. Sometimes we get some new clothing. Sometimes there are diapers. Sometimes there are new or near new work boots. Absolutely. 100% free. Freely we have received; freely we give. No obligation. Take what you need and walk out the door. Simple. If someone wants to make a donation, they certainly can. We will pass along all donations (100% of all donations) to the Whitehorse Food Bank. Our free clothing room started when parents from our Daycare dropped off clothing and asked if any other daycare parents could use them. As the collection grew, we decided to open up the clothing room to the public. When we do take clothing, we will ONLY process clothing that is obviously clean, near new, and folded neatly. Clothing that is dumped in a garbage bag and left with us will be discarded. However, clothing that has been obviously well taken care of will almost certainly be put out for the public. Please see further instructions on the right. Will My Donated Clothing Be Sold? We will not sell clothing. It is free. 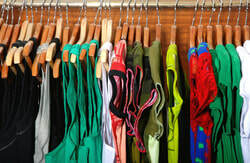 Sometimes if we have too much of some types of clothing we will collect the extra and take it to another organization who might sell it, recycle it, or discard it. What about Toys or Household Items? I'm afraid our clothing room is much too small for anything other than clothing. Toys or household items will be disposed of at our discretion and will not be available in our clothing room. We ask that only clothing be dropped off here. The Church of the Nazarene (2111 Centennial) is accepting a very limited selection of clothing. Before bringing any clothing please be sure to read the instructions below and then contact us (Facebook or on our website) to set up a drop off time. Please do not leave clothing randomly outside. Clothing left outside will not be processed. Clothing that is dumped in a garbage bag will not be processed. Making a clothing donations is as easy as 1-2-3. Read the list of what we need and don't need. Contact us and set up a time for when you can drop off clothing from our "need" list. Sort & fold the clothing and drop if off inside our building after you have contacted us. Anything worn out or stained or torn. Dresses (no skirts; have too many). PLEASE do not drop off ANY clothing outside and without prior notification. Sorry, but any such clothing will not be processed in our clothing room.